Today NetherRealm Studios and Warner Bros. has released today the new Ultimate Edition of Injustice: Gods Among Us. The Ultimate Edition combines all the DLC characters and stages into the base game. Not only is this new addition available for Xbox 360 and Sony's PlayStation 3 but this edition is also now available for PlayStation 4, PlayStation Vita and the PC (via Steam). The PlayStation Vita version of the game was ported by Armature Studio while High Voltage Software did the PS4 and PC port of the game. Also available exclusively on the PlayStation 4 version is a new Black Adam New 52 Skin. This new skin is unlocked in the iOS/Android version of Injustice after you beat 1 ladder in Challenge Mode. BURBANK, Calif. � Nov. 12, 2013 � Just in time for the holidays, Warner Bros. Interactive Entertainment and DC Entertainment today released Injustice: Gods Among Us Ultimate Edition in North America. 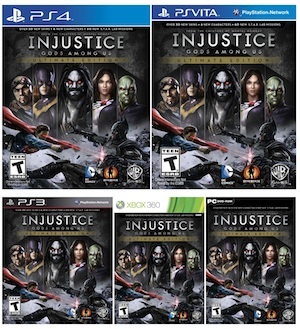 Developed by award-winning NetherRealm Studios, Injustice: Gods Among Us Ultimate Edition marks the debut of the best-selling fighting game franchise on the PlayStation 4 computer entertainment system, PlayStation Vita handheld entertainment system and Windows PC, and also brings this content rich version to the Xbox 360 games and entertainment system from Microsoft and PlayStation 3 computer entertainment system. The game is scheduled for release in Europe and other international territories beginning Nov. 29. Packed with material valued at more than $120 USD, Injustice: Gods Among Us Ultimate Edition is comprised of the full game, as well as all previously released downloadable content (DLC). The game has a suggested retail price of $59.99 for PS4 system, PS3 system and Xbox 360, $49.99 for Windows PC and $39.99 for PS Vita. Originally released April 2013 for PS3 system and Xbox 360, Injustice: Gods Among Us is a bold new fighting game franchise that introduces a deep, original story featuring a large cast of favorite DC Comics icons such as Batman, The Joker, Green Arrow, Superman, The Flash, Wonder Woman and many others. 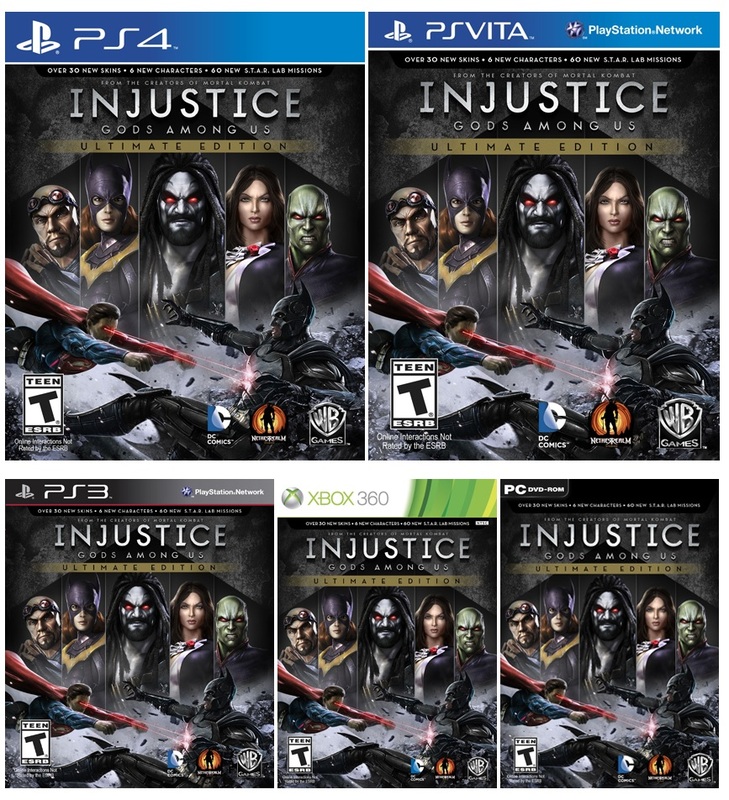 Injustice: Gods Among Us Ultimate Edition features additional DC Comics icons Lobo, Batgirl, General Zod, Martian Manhunter and Zatanna, as well as a special guest character Scorpion, from the Mortal Kombat Franchise as reimagined by Jim Lee, Co-Publisher at DC Entertainment. Fans will enjoy access to more than 40 extra character skins and 60 S.T.A.R. Labs Missions originally offered as DLC, and now available to players from the start of the game. Also packaged with the Americas version is the music soundtrack featuring an exclusive song from Jane�s Addiction titled "Another Soulmate" and 11 songs from popular artists ranging from Depeche Mode to AWOLNATION. Remastered for next-gen technology by High Voltage, the PS4 system version features Touchpad functionality, video sharing and streaming, and links to players� PlayStation Network Feed page during match wrap-ups and pause menus. High Voltage worked with NetherRealm Studios to develop the PC version of the game. The PS Vita version, which is adapted for the handheld experience by Armature Studio, takes the fighting action of Injustice: Gods Among Us on the go, with new touch controls for mini-games in the story mode and S.T.A.R. Labs Missions, Ad-hoc and Wi-Fi multiplayer, collectible hero cards, and all DLC released to date.